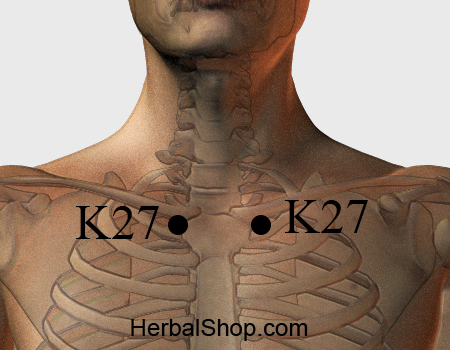 Activate body’s self-healing power with Acupressure. Location: in the depression below the collar bone next to the breast bone on both sides. Benefits: anxiety, panic attacks, hiccups, cough, sore throat, balance the energy. To activate your body’s self-healing power, first locate of the acupressure points that you need to work on for your specific needs. Apply firm pressure is the most fundamental technique. Use thumbs, fingers, palms, the side of the hand, or knuckles to apply steady, stationary pressure to the point for 1-2 minutes. A general guideline to follow is that the pressure should be firm enough so that it hurts a little. The more developed the muscles are, the more pressure you should apply. If you feel extreme sensitivity or pain, gradually decrease the pressure until you find a balance between pain and pleasure. Do not continue to press a point that is excruciatingly painful. It’s important to drink plenty of warm water after the massage, helps to clear away toxic substances in our body. Caution: please consult with your physician before practicing Acupressure.